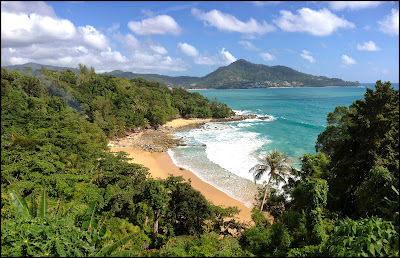 It's been a couple of weeks since the last Phuket weather blog update (on June 26th) and the weather has continued to be a typical low season mixed bag, but certainly not a really wet low season. The main reservoir still looks pretty dry and we're going to need some wet weeks in the next few months or there will be water shortages later in the year. A summary with some photos below of the last couple of weeks weather. Please do follow me on Twitter for regular weather updates, Phuket news, photos and more ... Jamie on Twitter. The weather news might be lacking in the second half of July, as I will be in England, but at any time you can check the weather by looking at the webcams on this page including the new Karon beach webcam. Also, and I keep saying this ... in low season you can often get big waves and rip currents at the beach. if you see big waves, don't go swimming. 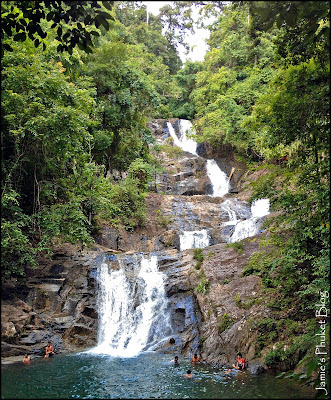 On June 28th I dragged the family out for an afternoon drive over the hill to Patong and then north to Kamala beach and onward to Surin beach. We'd not been to Surin for years and I wanted to see the "new look" Surin now that beachfront bars and restaurants had been removed, as is happening at most beaches to make things look more natural. 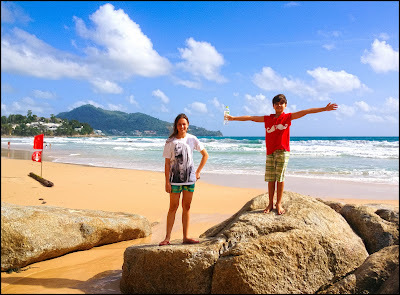 (above) our kids at Surin Beach, June 28th - and very nice weather! And we also stopped at Laem Sing beach, between Surin and Kamala, now also being cleared of beachfront development. On June 29th .. totally different weather. I Tweeted "After a few lovely sunny days in Phuket, today is grey and looks like about to get very wet", and a bit later "Afternoon weather report ... it's p*ssing down"
June 30th "4:20am ... Woken up by the sound of heavy rain ... Hopefully it'll stop by morning", but later in the day "Sunny day, but big waves at Karon beach"
And welcome to July! On July 1st, I Tweeted "Phuket weather this morning ... grey and drizzly"
But July 2nd was different again "Lovely sunny morning in Phuket and hardly any wind. Waves getting smaller"
And July 3rd "Good morning from Phuket and it's a lovely sunny morning. Still some waves at the beaches, but not as rough as a few days ago"
I went into old town on July 3rd evening for dinner at Kopitiam on Thalang Road. On July 4th - a day off work! And i got a little sunburned working in the garden (exciting expat life!) There was a heavy 10 minute shower of rain, and then it was sunny again. 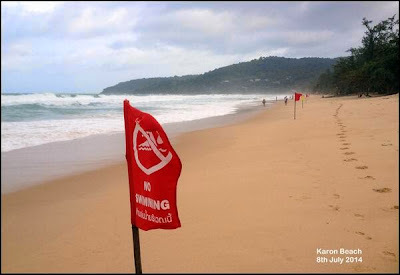 July 8th "Rough at the beach today, reg flags all along Karon beach .. no swimming"
July 9th "Windy morning on Phuket island, but no rain (yet)" and later "Quite a sunny afternoon now at Karon Beach, Phuket, but big waves at the beach"
July 10th - same as the 9th! Sunny, windy, big waves. And I say again. If you see big waves, don't swim. 2 drownings in the last 2 weeks, one at Kata, one at Karon beach. Stay safe please. July 11th was a less sunny day, some showers, lots of grey skies. Also was the start of the 6th Kathu street festival in the Kathu area of Phuket between Phuket Town and Patong. I did not attend, since I was working and did not get home until 7pm, but will hopefully visit this evening, weather today is much nicer although there are some showers around. Reminder - please do follow me on Twitter for weather updates, Phuket news, photos and Phuket blog updates. Cheers!